Dr. El-Kadi is a professor in the Faculty of Pharmacy and Pharmaceutical Sciences at the University of Alberta (Edmonton, Alberta, Canada) since 2001. At University of Alberta he moved through the ranks from Assistant to Full Professor. 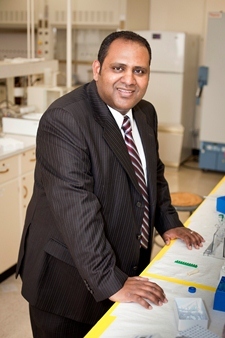 He was the Chair of Pharmaceutical Sciences Division (2005-2008), Director of Graduate Studies (2008-2009), and the Associate Dean for Research and Graduate Studies (2009-2013). Dr. El-Kadi received his BSc in Pharmacy and MSc in Pharmacology from Tripoli and Benghazi University (Libya) in 1990 and 1994, respectively. In 1999 he received his PhD in Pharmacology from University of Montreal (Montreal, Quebec, Canada). Thereafter, he did postdoctoral training in Molecular Toxicology at the University of Western Ontario (London, Ontario, Canada). Dr. El-Kadi’s research interests are in the areas of Pharmacology and Molecular and Environmental Toxicology. His research resulted in over 130 peer-reviewed papers in prestigious journals and similar number of abstracts and presentations. His research is supported by the Natural Sciences and Engineering Research Council (NSERC), Canadian Institute of Health Research (CIHR), Heart and Stroke Foundation of Canada, Canadian Foundation for Innovation (CFI) and several Biotech companies. He has supervised significant number of undergraduate, MSc, PhD students and postdoctoral fellows. He has served as editor, associate editor and member of the editorial board for a number of journals in the pharmaceutical sciences. 1. Understanding (i) the potential interaction between heavy metals and aryl hydrocarbon receptor (AhR) ligands which are common in the environment on the regulation of AhR-regulated genes, and (ii) investigate the effects of AhR ligand/metal mixtures on AhR ligands-mediated mutagenicity and carcinogenicity. These studies will a) increase our knowledge about the effect of heavy metals on the AhR-regulated genes, and b) provide the information that will help to design strategies to improve treatment of AhR ligands mediated mutagenicity and carcinogenicity. 2. Understanding the role of cytochrome P450 (CYP) enzymes in the pathogenesis of cardiac hypertrophy. Understanding the pathogenesis of cardiac hypertrophy may provide important clues for the development of rational therapies for the prevention and treatment of heart failure. The development of these rational therapies will decrease morbidity and mortality and hence diminish health care costs. 3. To identify an aryl hydrocarbon receptor antagonist from natural source that may serve as anticancer drug. Anwar-Mohamed A, Elshenawy OH, Soshilov AA, Denison MS, Chris Le X, Klotz LO, El-Kadi AO. Methylated pentavalent arsenic metabolites are bifunctional inducers, as they induce cytochrome P450 1A1 and NAD(P)H:quinone oxidoreductase through AhR- and Nrf2-dependent mechanisms. Free Radic Biol Med, 67:171-87, 2014. Amara IE, Anwar-Mohamed A, Abdelhamid G, El-Kadi AO.Mercury modulates the cytochrome P450 1a1, 1a2 and 1b1 in C57BL/6J mice: in vivo and in vitro studies.Toxicol Appl Pharmacol, 266(3):419-29, 2013. El-Sherbeni AA, El-Kadi AO. Alterations in cytochrome P450-derived arachidonic acid metabolism during pressure overload-induced cardiac hypertrophy. Biochem Pharmacol, 87(3):456-66, 2014. Althurwi HN, Tse MM, Abdelhamid G, Zordoky BN, Hammock BD, El-Kadi AO. Soluble epoxide hydrolase inhibitor, TUPS, protects against isoprenaline-induced cardiac hypertrophy. Br J Pharmacol, 168(8):1794-807, 2013. El Gendy MA, Soshilov AA, Denison MS, El-Kadi AO. Transcriptional and posttranslational inhibition of dioxin-mediated induction of CYP1A1 by harmine and harmol. Toxicol Lett, 208(1):51-61, 2012. El Gendy MA, Somayaji V, El-Kadi AO. Peganum harmala L. is a candidate herbal plant for preventing dioxin mediated effects. Planta Med, 76(7):671-7, 2010.